Young puppies, while adorable and fun, require a lot of care and attention. They're thrust into a new environment and must adapt while learning the basics of growing up. New owners must train and condition the new pup to become a loyal part of the household. Housebreaking is often the first major goal of ownership. Accidents are prone to happen in the early stages. However, you may start to notice that your new family addition is peeing far too much. They may even pee inside the house right after doing so outside. It's important for owners to take this problem seriously. Constant urination can be a product of a number of problems. Instead of getting angry or ignoring the issue, owners should be proactive. By understanding why this problem is occurring, you can find solutions to prevent further accidents and regulate their pee. There are a number of reasons why a pet may be urinating too much. Reasons can range from simple behavioral issues to more serious health complications. In some cases, it may be a combination of reasons. The first step in fixing the problem is identifying it. Young puppies are new the world and haven't developed proper training to curb common behavior problems. You'll find that during the first few months of ownership puppies will display a variety of problematic behaviors, many of which involve peeing where they're not supposed to. Marking is a common act among dogs of all ages. Urine acts somewhat like a signature for dogs. Dogs know if another animal has urinated in the vicinity, and may display odd behavior because of it. It's also done to impress other dogs. New puppies often mark items and new areas by peeing in various spots in and out of the home. This is even more common with dogs that aren't spayed or neutered. When a puppy experiences feelings of fear or anxiety, they will pee excessively. Newer puppies latch onto their owners pretty quickly. If you don't have the time to spend all day with the pup, they may begin to experience separation anxiety. Experiencing new people, animals, and places can also cause them to feel uneasy, resulting in urination. On the other side of the spectrum, puppies will pee out of pure joy and excitement. They may piddle when you walk through the door after a long day of being away or when they receive a treat. Other times, puppies urinate as a sign of submission. Contrary to popular belief, dogs don't pee out of spite. Most times, they'll have an accident simply because they are feeling an extreme emotion they aren't used to. 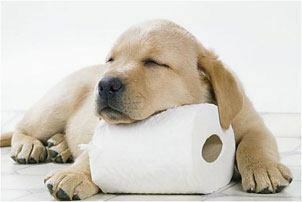 Puppies are susceptible to a variety of medical conditions, some of which can directly affect their urination patterns. It's a good idea to get the puppy examined by a veterinarian. They'll be able to determine if any underlying medical causes are the source of the problem and can administer treatment to rectify it. A UTI can plague dogs of any age. It's a broad condition that can vary dramatically in terms of severity. Some forms of infection can be treated easily with antibiotics while others are more severe. There are many symptoms to look out for if a UTI is a concern. The condition of the urine is a good indicator. While it might not be pleasant, it's a good idea to monitor the urine's appearance and odor. If it's cloudy and pungent, a UTI may be the culprit. Another thing to look out for is the puppy's behavior. If they are yelping when urinating, they may be experiencing significant pain. Constant licking is a sign that they are trying to soothe it. Vomiting and fevers are also symptoms. Diabetes in dogs is very similar to that of humans. It can be caused by an inadequate amount of insulin being produced or by a hormonal imbalance. Either way, it causes frequent urination. Testing for diabetes in dogs involves blood and urine samples. 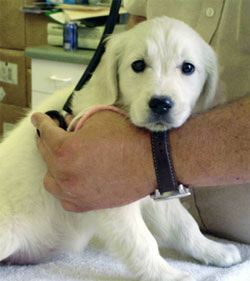 It's a necessary test, as puppies with diabetes will require lifelong care. While water is a good thing to give growing puppies, too much of it can make them pee far too frequently. Not only that, but new puppies tend to feel the need to urinate after just 30 minutes of drinking. If the puppy has too much access to water, they'll continue to drink throughout the day. It'll pass right through them, leading to frequent accidents. This is one of the most common reasons why puppies have accidents. A young pup of only 8 weeks doesn't have the same bladder control as an adult dog. They can't control it the same way and often don't know that they need to urinate until that very moment. This is why a puppy will pee a bit outside and then pee some more inside. They don't know when it needs to be emptied. Over time, the bladder will strengthen, allowing them to control their urination better. In addition to getting the pup checked by a veterinarian for health concerns, there are a number of things you can do to help avoid an accident. Continued training and monitoring will change your puppy's behavior, allowing them to avoid accidents and pee outside like you want them to. A pee schedule will prove to be a huge mess saver in the long run. Routine is a great thing for growing puppies. Feeding schedules are common, so why not create a pee schedule as well? Without a schedule, puppies won't build up that confidence they need. By taking them out frequently, you're essentially teaching them that they need to urinate quickly and frequently. 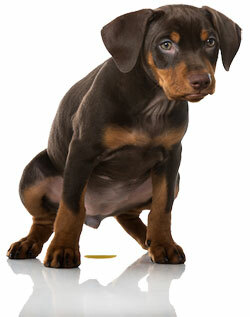 Routine teaches the puppy that they don't need to empty their bladders whenever they feel that it is full. With a schedule in place, there's no uncertainty. They know that you will let them out to do the deed at certain times throughout the day. Over time, this schedule will be a part of their daily routine. It becomes inherent to the point that they don't even beg to go outside, instead waiting for their designated time. A good place to start is 30 minutes after eating a drinking, as most pups feel the urge to pee at this time. As they grow older, you can slowly change it. Much like a schedule, having a designated spot for peeing will help them develop a familiar routine. You should find a spot in your yard that you can take the puppy to every single time. Eventually, they'll know that the spot is for urinating. They'll wait to go to that spot directly instead of wherever they are standing. One common mistake puppy owners make is leaving their water out all day long. Puppies will drink frequently, leading to increased urination. You should always pick up their water bowl after they're done drinking so that you can keep tabs on their intake. Does that mean depriving your puppy of water? Absolutely not. There's a recommended amount of water dogs should drink every day based on their weight. For every pound they weigh, dogs should drink one-fourth to one-third of a cup of water. This amount can be spread out throughout the day, starting with early morning meals. All of the recommended amounts should be finished roughly two and a half hours prior to going to bed. Puppies sleep around the same amount as humans do. Seven hours of sleep is common before feeling the need to pee. If puppies are given their last water 2 and a half hours before sleep, they'll need to pee in this time frame. 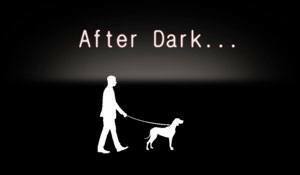 It's important to let puppies out prior to going to bed so that they can empty their bladders for a long night of uninterrupted sleep. That being said, the urge may strike in the middle of the night. If it does, it's a good idea to let them out without any positive affirmations or engagement. Simply let the puppy out to do their business and let them go back to sleep. If you do engage, they may take it as an indicator that it's alright to wake you to play. When you leave the house, it's important to put the puppy in a safe and comfortable spot. A crate is a good place to start during the training process. They'll grow comfortable in the crate. It will eventually become a place they can go to avoid stress. If you leave them to roam the house freely, they may experience separation anxiety and start peeing everywhere. For extra precaution, you can leave an item of clothing or a pillow sheet in the crate with them. Having your scent near will help avoid anxiety. If your dog is peeing due to overexcitement, it's important to be quick and let them out before they have an accident. Letting the puppy out right when you get home from being out will allow them to get everything out in the right spot. To stop this behavior completely, you need to desensitize them from your return. While it may be difficult to not gush over them when you walk through the door, it'll help them get used to the excitement. They'll lose interest in the event over time and stay calm. Social and behavioral problems can be very difficult to overcome. They often require much more attention and action from owners. The first step in remedying the problem is understanding what triggers the urination. You should watch them as they urinate, paying close attention to how they do it. If an accident occurs, pay attention to what caused it. From there, you can begin helping your puppy overcome whatever psychological problems they are facing. Regardless of why your puppy is peeing all the time, it's important to be patient throughout the process. Take it as a time to strengthen the relationship you have with your puppy. Continued training will lead to improved behavior and habits. While some issues may be harder to fix than others, all it takes is patience and understanding. The puppy isn't peeing frequently on purpose or out of spite. By understanding what the underlying cause is, you can take the necessary steps to fix the problem. 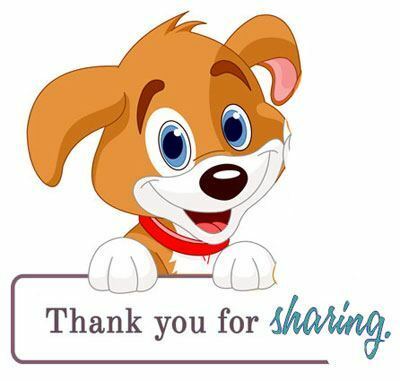 In the end, you'll have a well-behaved dog that knows their routine and loves you for teaching it to them. Also read : What Should Normal Puppy Poop Look Like?